Many might call this box mod a baby, but it is for sure not going to perform like one. A new minituarized version of the G-Priv Kit. The G-Priv Baby Luxe 85W Starter Kit by Smok is going to be an impressive mod that is going to work well with the e liquids you have on deck. This mod has a wattage output range of 1W to 85W, and when it comes to resistance, it all depends on the coil you are working with that determines the correct wattage output to use. The V8 Baby-Q4 quadruple coil has a resistance of 0.4ohm, and the V8 Baby-Q2 dual coil has a resistance of 0.4ohm, but both have different recommended wattage outputs. With these many options, it is inevitable that you will find one that best fits your vaping needs. This box mod requires a single high-amp 18650 battery that is sold separately but makes your mod work amazingly. The tank is able to hold 4.5ml of e liquid that is going to be more than you need to get you through a long day. Even if you run out, the top fill design will make it easy for you to fill it back up. This box mod has a compact size, so just pop it in your pocket and get moving. 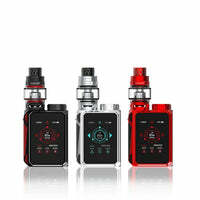 G-Priv Baby Luxe 85W Starter Kit - Smok has a rating of 4.2 stars based on 6 reviews.